My newest Christmas tradition marks the return of a forgotten one. Christmas confession: my name is Heath Holland and I’m an Ernest fan. There, I said it. They say that the truth shall set you free, and I should feel liberated now. So why do I still feel a little dirty? Ernest was sort of like a local hero for us in those days. Looking back on it, he was a little bit like a southern Pee Wee Herman: an eccentric man who lived alone in a wacky house full of toys and trinkets and found himself in increasingly intricate adventures that he always managed to scrape through with a sense of humor and a twinkle. Ernest was clearly not the sharpest knife in the drawer, but he meant well and he had a lot of heart. I loved the character, and so did all my friends. He was an adult, but he was also one of us. He made mistakes and he learned lessons, but we also thought he was really funny. Years before Jim Carrey rose to stardom on In Living Color, Jim Varney made faces with his rubber mug that we would all practice in the mirror and try to impress our friends with. Ernest had a meteoric rise during the ‘80s, indicating that most of America seemed to feel exactly the same way. His commercials evolved into a series of nine low budget movies and even a Saturday morning cartoon. On New Year’s Eve in 1988, Ernest hosted Happy New Year, America. For a short time between 1987 and 1990, Ernest was a national sensation. The most financially successful of his movies, Ernest Saves Christmas, was released during the holiday season of 1988. 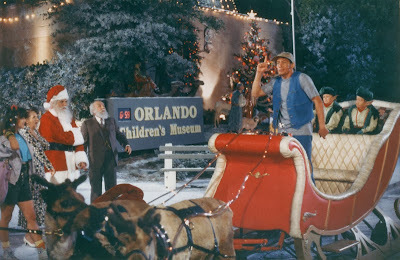 Ernest begins the movie as a bumbling taxi driver in Florida who has a chance run-in with a man claiming to be Santa Claus. Santa says he is old and tired, and there’s a children’s television show host in Florida to whom he wants to pass the torch, but Jolly Old Saint Nick discovers that things aren’t going to be as easy as he thought. The world has changed and no one seems to believe in Santa or in Christmas. If Christmas arrives before he can pass the torch, there won’t be a Christmas at all anymore. That’s where Ernest comes in, eager to lend Santa a hand and save Christmas along the way. Just to get it out of the way, Ernest Saves Christmas is pretty awful, at least from a technical and critical point of view. The first and most obvious problem is a formulaic script that’s full of clichés and characters straight out of Screenplay Writing 101. We have Ernest, our oafish-but-well-meaning hero, accompanied by a street-smart teenager who has chosen a life on the run because her parents just didn’t have enough time for her. The children’s television show host is managed by a slimy, bloodsucking Hollywood-type who calls people “babe.” Every single person here is an archetype, not an actual character. On top of this, most of the comedy is extremely broad. There’s a lot of physical stuff, spearheaded by Varney’s face-twisting antics. And the budget of $6 million covers the film stock itself and the craft services, but doesn’t stretch far enough to give the film any real weight or atmosphere. It’s hard to film anything for $6 million (even in 1988), but it’s especially hard to film a movie about Santa Claus, his reindeer, and one magical night around the earth. But there’s something about the movie that feels so sincere and…for lack of a better word, earnest. I wonder if Varney named his character to be a play on words. Ernest is just this side of a cartoon character, but he’s always helping people around him. This separates him from Pee Wee Herman, because Pee Wee has a slightly cynical undercurrent. Ernest seems to only be concerned with helping people. Also, if you can lower your own cynical walls, it’s funny. Sometimes it’s REALLY funny. There’s plenty there for kids (who are the target audience for this) such as Ernest’s funny faces and catchphrases, but there’s some sly humor for adults as well. And Varney plays no fewer than four characters in the film, including an elderly woman with too much makeup and a neck brace. In the tradition of Monty Python, men dressed as women are always entertaining. Come to think of it, Ernest may be a southern American version of Mr. Bean. It’s pantomime. It’s vaudeville. 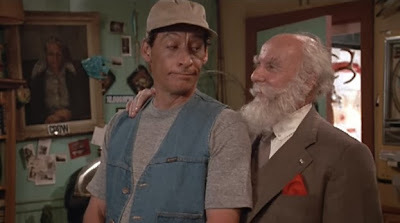 I’ve had a complicated relationship with Ernest P. Worrell over the last couple of decades. In the early ‘90s I disconnected from the character completely. I don’t seem to have been the only one, either; a decline began around that time and Varney’s later Ernest movies went straight to VHS. While Varney found success with Pixar as the voice of Slinky Dog in the first two Toy Story films, his most famous character never again ignited any significant interest with the public. When Varney died of cancer in 2000 at the age of 50, it wasn’t in obscurity, but it was far from the heights he’d experienced in the 1980s. It was a kid who brought it all back around for me. 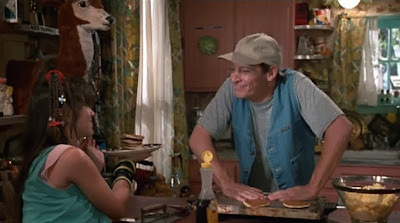 Last year my step-daughter went to her grandmother’s house and they watched an Ernest movie, which she instantly fell in love with. I bought Ernest Saves Christmas for her and we watched it together a few days before Christmas last year. I don’t think I had thought about the character in the twenty years that transpired between then and the last time I had watched it, and my opinion of Ernest was not a good one. But it was good! Okay, not good…but it was sweet. It was uplifting, and it made me FEEL good. When you think of major family holiday films that have been released since Ernest Saves Christmas, you think of movies like Jingle All The Way, The Santa Claus Trilogy, Elf and Home Alone. All of those have a bit of a mean streak running through them. They present a more dangerous, threatening world. But Ernest Saves Christmas almost feels like it could have been made twenty or thirty years before it actually was. Reality doesn’t enter into the film, and it’s a safe place to spend 90 minutes without ugliness or violence. When a crate containing a reindeer falls on a man, it doesn’t hurt him. Instead, it flattens him like a Looney Tunes character. This is a world where no one gets hurt and no one dies. We’ve watched the movie again this year and it’s a new tradition. My step-daughter loves Ernest, and now, after a long time away, I do too. All of the negative opinions I formulated about him as I got older are true: he’s a goofy character who relies on slapstick and lame jokes that would make even the corniest of dads groan. But he’s also a kind person who spends the entirety of Ernest Saves Christmas helping people; sometimes that means trying to save Santa Claus and Christmas. But in the case of the street-wise teenage girl who has run away from home, it means just giving her a place to stay and listening to her so she feels important. Ernest Saves Christmas challenges me. Many Christmas specials and movies do not challenge me, they just entertain me. But when you take away all the cynicism, the messages of commercialism, even the feel-good fluff of so many of them, few movies have the sincerity and heart for helping those around us like Ernest Saves Christmas does. It’s not selling anything. It doesn’t have Happy Meal tie-ins, and he doesn’t wear Nike or drink Pepsi. It’s not presenting a product, it’s simply asking us to try to enjoy ourselves and remember what it’s like to be a kid. That’s not something I’m particularly comfortable with. It’s easier to simply be entertained and get a little burst of pre-packaged Christmas cheer. But Ernest would remind me that there are other people out there who could use a helping hand from time to time. I wish that the message came in a more polished film, but it doesn’t. Maybe that’s the point. I’ve come full circle with Jim Varney’s most personal and successful character, even though it took me over twenty years to do it. Thanks to movies like Ernest Saves Christmas, I’m a fan once again. 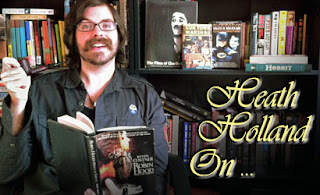 Yes, it’s silly, and it’s broad, and it’s never going to be on any best-of lists. But that doesn’t mean that it doesn’t have something to say. On the contrary, it speaks louder than many of its peers. Here’s wishing you a Merry Christmas and Happy Holidays. Really nice column Heath! I was a big Ernest fan as a kid - almost more so because my parents said it was too stupid for me to watch. It became like a forbidden form of entertainment. Now it makes me hard as a f***in' rock. JK...I was watching Don Jon and couldn't resist. Seriously, wow. I never thought anything could make me seriously want to reevaluate Ernest P. Worrell, but here it is. I've only ever seen his first movie, ERNEST GOES TO CAMP (in a theater in NY, so that speaks to his national prominence at the time) and I don't remember a thing about it, though I'm relatively certain I enjoyed it then (I think I was 11 or 12 when it came out, I'm too lazy to look it up). I absolutely love everything you say here about the lack of cynicism in his character, and it makes me truly want to take another look at the movies. Excellent piece, Heath. Merry Christmas to you & your family (and the entire F This Movie! family while we're at it). Tremendous positivity like this is what keeps so many of us coming back here, and it never stops feeling like a special place to be. Wait...the Michael Keaton treaclefest or the rampaging murdersnowman one? Because either way, I'm in. I never knew an article about Ernest could warm my heart, but yours just did. By the way, while I was reading, the song Silent Night was playing in the background of my inlaw's house. That helped give your article an extra oomph in the emotional department. Try it.